With limbs sprawling, this treefrog is climbing up the wall. Bright oranges with yellow accents make this piece pop. The metal-work is textured representing the textured skin of most tropical treefrogs. 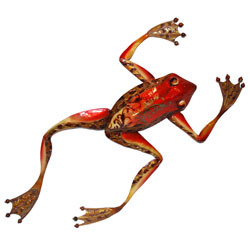 The artist also uses capiz shell, which is then hand-painted to different orange hues, representing the reflective properties that this treefrog has. Easily liven up any space by bring a piece of nature to your room. The basic frame of the frog is created using tin, which is powder coated with a black finish. The frame is reinforced using tin wire along the inner edge. Capiz is an oyster shell and the primary purpose of the oyster is as a source of food. However, the by-product, the shell, can be used for decoration. Due to it being a natural material, the natural colors of the capiz come through as tans and browns underneath the paint. The shell is then painted the bold colors you see. The entire front facing piece is carefully hand-painted keeping in mind the reflective qualities in the color of frogs.